Poppies in the morning, image © John Shevlin and Historic Royal Palaces, 2nd September 2014. 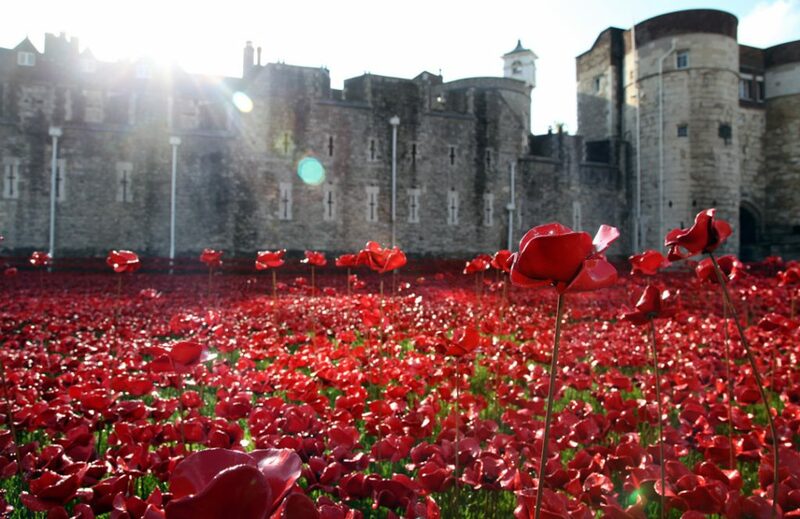 To commemorate the 100th anniversary of the start of the First World War, Paul conceived and created a truly memorable installation, Blood Swept Lands and Seas of Red at the Tower of London between 17 July and 11 November 2014. The installation was made up of 888,246 handmade red ceramic poppies, one for each British and Colonial life lost at the Front in the First World War. Each day thousands of poppies were ‘planted’ in the Tower’s moat by volunteers from across the world. Each poppy from the installation was sold, with proceeds donated to charity. With 5 million visitors travelling to see the poppies, and over £9 million raised for six service charities through the sale of the flowers, the installation was called a global phenomenon. Two key sculptural elements from Blood Swept Lands and Seas of Red were preserved for the nation by the Backstage Trust and Clore Duffield Foundation and then toured by 14-18 NOW, the UK arts programme for the First World War centenary. As part of this tour, Poppies: Wave and Weeping Window were presented at 19 selected locations around the UK and seen by over 4.6 million people between 2015 – 2018. The sculptures have now become part of the Imperial War Museums’ collection. Below is the complete process Paul Cummins and his team embarked upon when working on Blood Swept Lands and Seas of Red, documented through the use of images, from its conception to completion. Please scroll, or use the scrollbar below to navigate through the images. Project outlines on the walls of Paul’s studio: The poem within a will that Paul discovered in September 2012, which formed the inspiration behind Paul’s installation, Blood Swept Lands and Seas of Red. This poem sits alongside initial design composites used when pitching the project to Historic Royal Palaces in August 2013. Craftsmen in Paul’s studio rolling clay so that it could be moulded to create poppies. Linens used for flattening and drying clay hanging in Paul’s studio. Artist cutting clay to make ceramic poppies. Artist working on moulding poppies in Paul’s studio. Large clay cut-out poppies ready to be moulded. To create six petals, the team created a large poppy cut-out and then a small poppy cut-out. These were then placed one on top of another, and then a hole cut for the stem. Once a hole was created for the stem, each poppy was hand-moulded by ceramic artists into an individual poppy. Paul and his team laying out hundreds of moulded poppies to dry. The poppies being taken to be glazed and fired. Glazed and fired poppies, waiting to be transported to London and ‘planted’ in the moat. Yeoman Warder plants first poppy © Richard Lea-Hair and Historic Royal Palaces, 17th July 2014. Yeoman Warder plants first poppy image © Richard Lea-Hair and Historic Royal Palaces, 17th July 2014. Workers installing Wave at HRP Tower of London, image © John Shevlin and Historic Royal Palaces, 17th July 2014. The base of Wave at HRP Tower of London, image © John Shevlin and Historic Royal Palaces, 17th July 2014. Poppy heads being attached to Wave at HRP Tower of London, image © John Shevlin and Historic Royal Palaces, 17th July 2014. Volunteer plants poppies at HRP Tower of London, image © John Shevlin and Historic Royal Palaces, 28th July 2014. Yeoman Warder walks through thousands of poppies, image © John Shevlin and Historic Royal Palaces, 28th July 2014. The growing field of poppies at HRP Tower of London, image © Richard Lea-Hair and Historic Royal Palaces, 4th August 2014. Poppies from below, image © Richard Lea-Hair and Historic Royal Palaces, 4th August 2014. Visitors to the Tower pass under Wave, image © Richard Lea-Hair and Historic Royal Palaces, 4th August 2014. Weeping Window flows from a window in the Tower, image © Richard Lea-Hair and Historic Royal Palaces, 4th August 2014. Close up of Weeping Window at HRP Tower of London; image © Richard Lea-Hair and Historic Royal Palaces, 4th August 2014. The Duke and Duchess of Cambridge visit the poppies with Prince Harry; image © Richard Lea-Hair and Historic Royal Palaces, 5th August 2014. Local cadets visit to plant poppies, image © Charlotte Goodhart and Historic Royal Places, 23rd September 2014. Poppies by night, image © Richard Lea-Hair and Historic Royal Palaces, September 2014. During the installation, every evening the Last Post was played at sunset and 134 names of those who were killed in the First World War were nominated to be included in the Roll of Honour ceremony. Image © Richard Lea-Hair and Historic Royal Palaces, September 2014. Roll of Honour, image © Richard Lea-Hair and Historic Royal Palaces, September 2014. War Horse visits the poppies at HRP Tower of London, image © Richard Lea-Hair and Historic Royal Palaces, 19th September 2014. War Horse amongst the poppies, image © Richard Lea Hair and Historic Royal Palaces, 19th September 2014. Her Majesty The Queen and Prince Phillip walk amongst the poppies, image © Richard Lea-Hair and Historic Royal Palaces, 16th October 2014. Her Majesty The Queen and Prince Phillip are presented with a wreath of poppies gifted by Paul Cummins on their visit to the installation, image © Richard Lea-Hair and Historic Royal Palaces, 16th October 2014. Poppies from the Tower ramparts, 5th November 2014. Image © Richard Lea-Hair and Historic Royal Palaces. Crowds gathering to see the poppies in the lead up to their final few weeks at HRP Tower of London. Image © Richard Lea-Hair and Historic Royal Palaces, 5th November 2014. Poppies from The Marsh Building, 8th November 2014. Image © John Shevlin and Historic Royal Palaces. Crowds and poppies from The Marsh Building, 8th November 2014. Image © John Shevlin and Historic Royal Palaces. Blood Swept Lands and Seas of Red from The View from The Shard, image © John Shevlin and Historic Royal Palaces, 8th November 2014. The poppies surrounding the Tower on the 8th November 2014. Image taken from The View from The Shard © Richard Lea-Hair and Historic Royal Palaces. The final poppy planting ceremony, 11th November 2014. Image © Richard Lea-Hair and Historic Royal Palaces. Paul watches on as Berkshire cadet Harry Hayes, 13, plants the 888,246th poppy at the Tower of London. Image © Richard Lea-Hair and Historic Royal Palaces. The final poppy is ‘planted’ by Harry Hayes, 13. Image © Richard Lea-Hair and Historic Royal Palaces. © 2019 Paul Cummins Ceramics. All Rights Reserved.